With cold weather arriving and the holidays ahead, local soup kitchens and food pantries are fearing lean times ahead after experiencing a drop in donations from traditional sources and at the same time seeing a growth in demand for food for the hungry. "From 2006 to 2007, we experienced a 23.8 percent decrease in food donations," said Amy Pessia, executive director of the Merrimack Valley Food Bank, which provides food to about 100 pantries and soup kitchens in Greater Lowell, the North Shore, and southern New Hampshire. Pessia said the food bank distributed 2 million pounds of food in fiscal year 2006. She estimates demand will increase about 10 percent this year. "The cost of living being what it is, with car payments, home heating fuel, and natural gas prices going up, people are finding it increasingly difficult to make ends meet," she said. "People who normally provide donations are feeling the financial pinch, too." Melanie Gosselin, executive director of the New Hampshire Food Bank, said it also is a "very challenging time" for her organization, which provides food to 345 agencies, primarily food pantries and soup kitchens, from Nashua to Berlin. "We usually have 700,000 pounds of food in stock, and we now have 126,000. That's a half-a-million-pound shortage," she said. Gosselin said the demand for food is up 30 to 40 percent this year. "It's hard to say why," she said. "Higher gasoline prices, the rise in the price of home heating oil and natural gas. . . . The working poor are feeling the pinch, and so are the people who normally make donations." The food bank also has experienced a significant drop in donations from local supermarkets. "We used to receive eight tractor-trailer trucks a month; now we only receive about three," Gosselin said. She attributes the drop to computerized inventory control at supermarkets that results in less overbuying - formerly a big source for food banks. What little is left is sold on the salvage market. "The supermarkets have become more efficient," she said. That might be good news to the businesses, but it doesn't bode well for agencies that gather food for the poor. My Brother's Table, a soup kitchen in Lynn, is among the groups that receive donations from the Merrimack Valley Food Bank. Ilia Stacy, executive director of the kitchen, said the group served 90,000 meals last year and is expecting to serve more this year. In the past couple of months, the number of lunches served at the kitchen has nearly doubled, to about 100 a day. The kitchen also serves dinner to about 200 people each night. "It's too soon to say what's going to happen," she said. "At this point, [we are] not too pinched. But we're paying close attention." Lisa Christie, executive director of the Nashua Soup Kitchen and Shelter, also has seen an increase in demand. "For the first time in the 18 years I've been here, we've served dinner to more than 200 people in a dining room that seats 45," she said. Last year, the kitchen served 10,439 breakfasts and 27,906 dinners. The kitchen gets 75 percent of its support from private donations. Fortunately for the organization, there hasn't been a drop in the amount of money or food donated, but Christie said she expects demand to increase. How much, she is not sure. "Monetary donations don't appear to be down," said Ellen Parker, executive director of Project Bread, the leading contributor of funds to emergency food programs in Massachusetts. Every year, Project Bread donates about $2.5 million to Massachusetts emergency food programs, primarily money raised through its annual Walk for Hunger. Last month, the group distributed $211,425 to 45 emergency food programs on the North Shore alone. But Parker said money is not enough. "Local food pantries and soup kitchens rely on money from Project Bread, public money, and local food donations. Any drop in food donations or the number of volunteers has a significant effect," she said. "It takes a lot to run a local food kitchen, and they're under the gun." Major Chet Emmons, who oversees the Salvation Army food pantry and soup kitchen in Portsmouth, said a Rotary Club food drive last month collected 2,000 pounds of food and "got our supplies up to a workable level for a couple of weeks." 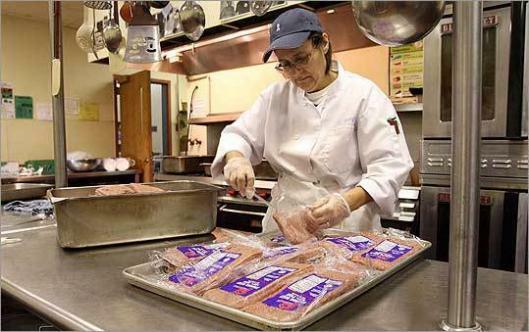 But this time of year, donations are slow to the kitchen, which serves from 45 to 75 people a day. "People have other things on their mind," he said. "But all donations are appreciated. We're a small operation - but we have a big need." In addition to canned goods, pasta, peanut butter, and other nonperishable food items, items that are needed at My Brother's Table in Lynn include small staples such as salt, sugar, and tea, according to Ilia Stacy, executive director of the soup kitchen. "We are always running out of tea," she said. Major Chet Emmons of the Salvation Army food pantry and soup kitchen in Portsmouth, N.H., said there's a shortage of fresh meats and vegetables as well as personal items like shaving cream and soap. Amy Pessia of the Merrimack Valley Food bank said baby blankets and supermarket gift cards are always welcome and, of course, cold, hard cash. "Sometimes helping out is as easy as writing a check," she said. Stacy agreed. "We pay $2,800 a month in rent to the city and about that much each month in utilities. Money is always helpful." She said donations of leftover food from catered events are also welcome. And, of course, there is always the gift of time. "Volunteering is a great family activity," Pessia said. "Some families even bring preschoolers along and they all have a great time." "The emergency food system is very dependent on volunteers," said Ellen Parker, executive director of Project Bread. "Local food kitchens in particular are very dependent on food donations and people who donate their time. If a Cub Scout pack or other community group decides not to hold a food drive, it can really hurt. It's a very fragile system."